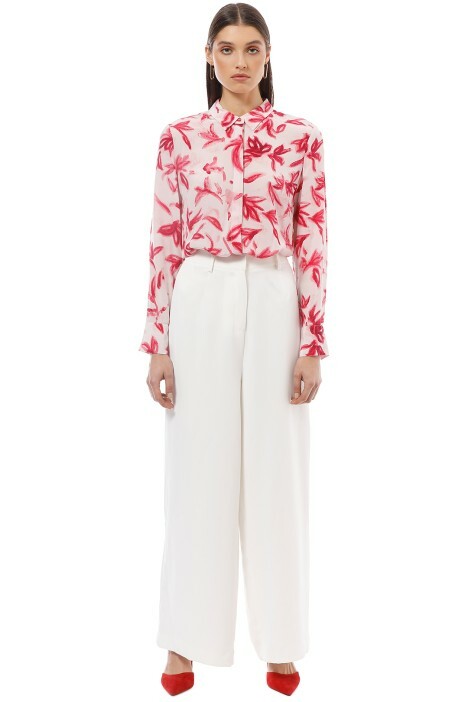 Beat the Monday blues by adding the Versaille Silk Shirt to your workwear wardrobe! Made from 100% silk, the sophisticated top features hand-painted botanical prints and has long sleeves with buttoned cuffs. A perfect balance of playful and elegant, hire this stunning top for a work function or a daytime event. Master the art of clashing prints by pairing it with grey check trousers and suede pumps. Add classic stud earrings and a sleek ponytail to complete your sharp and stylish work outfit. Rent a foldover clutch to hold all of your essentials. Check out our blog for our style tips on what to wear to a job interview! Pair this with the Anya White Palazzo Pants. One of Australia’s top fashion labels since its inception in 1914, Sportscraft prides itself in offering a wide range of high-quality clothing and on-trend accessories. With a reputation of clothing with consistent fit and classic styles with trendy elements, Timless and classic, Sportscraft has an extensive number of stores in Australia and New Zealand, and can also be found in David Jones and Myer.